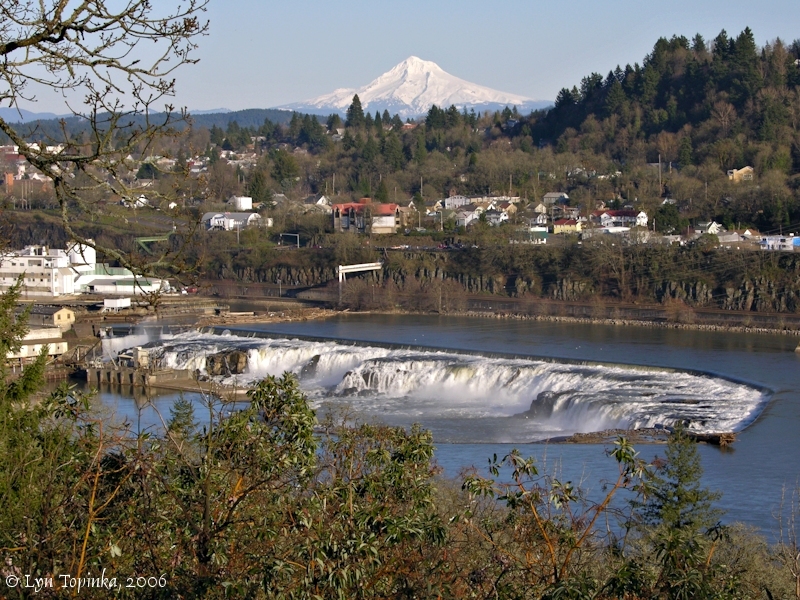 The Willamette Falls, at Willamette River Mile (RM) 27, are located in Oregon City, Oregon, where the Willamette River spills about 40 feet over horseshoe-shaped basalt ridge. Lewis and Clark make many references to the "falls of the Multnomah" and the Indian tribe which lived there. The falls were a major salmon fishing location. Later the falls furnished the power for a lumber mill (1842), a flour mill (1844), a woolen mill (1864), and the first paper mill in the Pacific Northwest (1867). 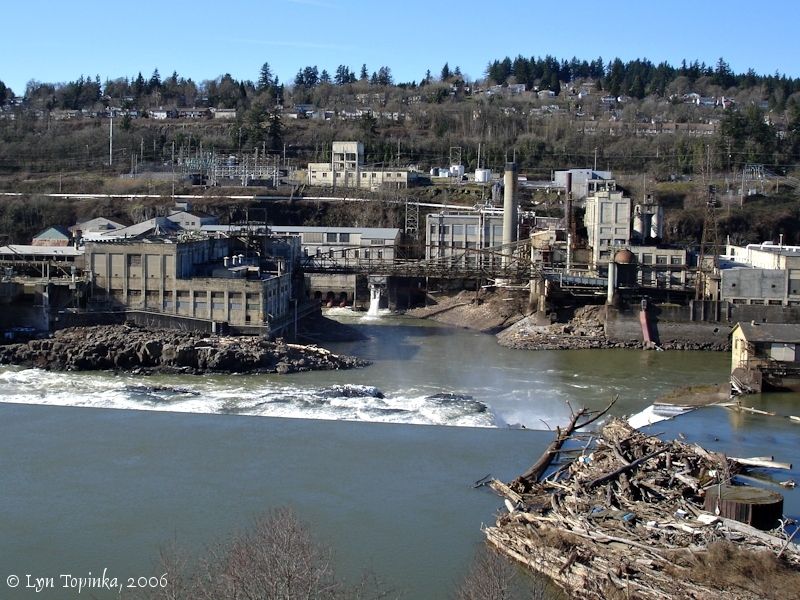 The first long-distance commercial electric power transmission in the United States went from Willamette Falls to the City of Portland in 1889. In 1873, the Willamette Falls Locks were opened when the steamer Maria Wilkins became the first vessel to navigate up the west end of the falls. "Coyote came to a place near Oregon City and found the people there very hungry. The river was full of salmon, but they had no way to spear them in the deep water. Coyote decided he would build a big waterfall, so that the salmon would come to the surface for spearing. Then he would build a fish trap there too. First he tried at the mouth of Pudding River, but it was no good, and all he made was a gravel bar there. So he went on down the river to Rock Island, and it was better, but after making the rapids there he gave up again and went farther down still. Where the Willamette Falls are now, he found just the right place, and he made the Falls high and wide. All the Indians came and began to fish." Source: U.S. Forst Service, Gifford Pinchot website, 2006, a Clackamas Chinook legend. 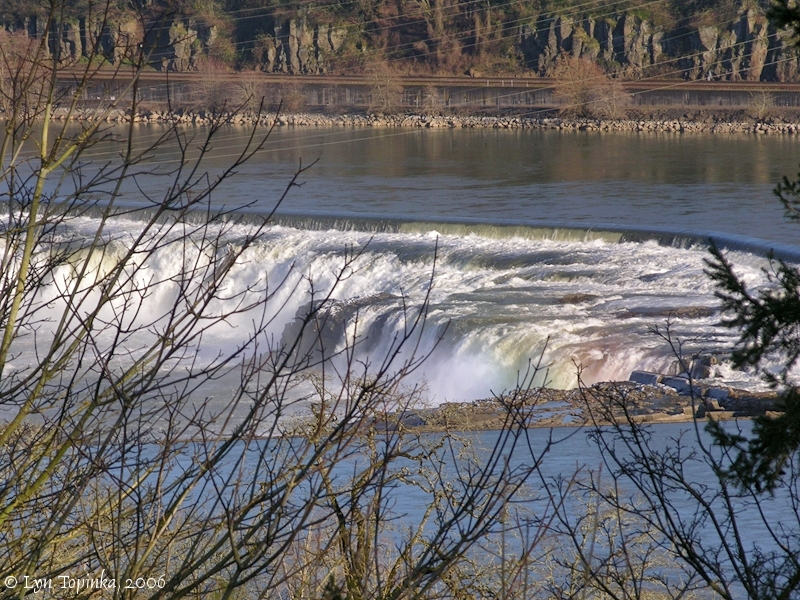 While Lewis and Clark never saw Willamette Falls, they were aware of its existence from information provided by visiting natives who arrived at camp. The "Small river which takes its rise in Mount Jefferson" is the Clackamas River which merges with the Willamette at Willamette River Mile 25. It was home to the "Clark a-mus nation". 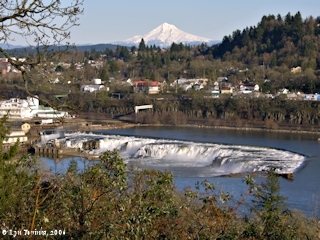 Click image to enlarge Willamette Falls, Oregon City, Oregon. Image taken February 19, 2006. 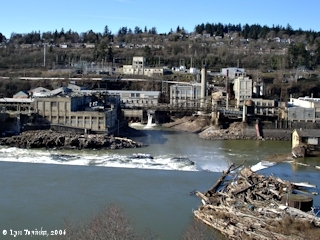 Click image to enlarge Below Willamette Falls, Oregon City, Oregon. Image taken February 19, 2006. 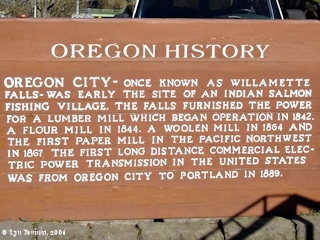 Click image to enlarge Willamette Falls, "Oregon History" sign. Image taken February 19, 2006. 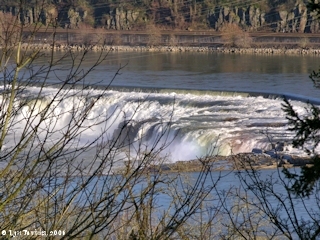 Click image to enlarge Rainbows, Willamette Falls, Oregon. Image taken February 19, 2006. "... From the Cowlitz the next course of the Columbia is SE. 2/3 S. for 27 miles to the mouth of the Willamette river (A corruption of the Indian name. This stream is the Multnomah of Lewis and Clark.) about 16 miles above the Cowlitz. The Warrior branch or slough of the river makes in from the west side and runs around Multnomah island, coming into the Willamette two miles above its mouth. The Willamette continues the same general course of the Columbia for 16 miles to the falls, where is situated the town of "Oregon City," destined to become a place of importance, on account of the extensive water power; the river there falling perpendicularly 38 or 40 feet. Six miles lower down on the Willamette is the rapidly improving town of Portland, situated at the head of ship navigation, with a population of nearly 5,000. The valley of the Willamette is well settled, contains several thriving towns, and is remarkably productive. The course of the river is southward, gradually approaching the coast within 25 miles, in the latitude of Cape Perpetua. In latitude 44o it runs eastward to the base of the Cascade range, which rises between the snow peaks of Mount Jefferson and Mount McLaughlin. ..."
The "Warrior branch or slough of the river" is the Multnomah Channel and "Multnomah island" is today's Sauvie Island. 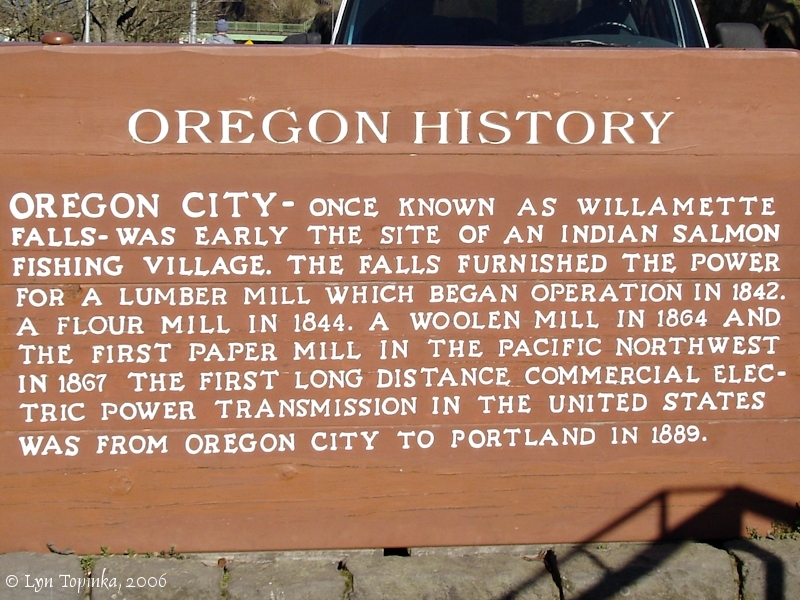 Oregon City, Oregon, located at the Willamette Falls at Willamette River Mile (RM) 26, was incorporated in 1845, making it the oldest American city west of the Rocky Mountains. The townsite was laid out and named in 1842 by Dr. John McLaughlin, the same Dr. John McLaughlin who was chief factor of the Hudson's Bay Company at Fort Vancouver. In 1829 Dr. McLaughlin took up a land claim on property next to the Willamette Falls. 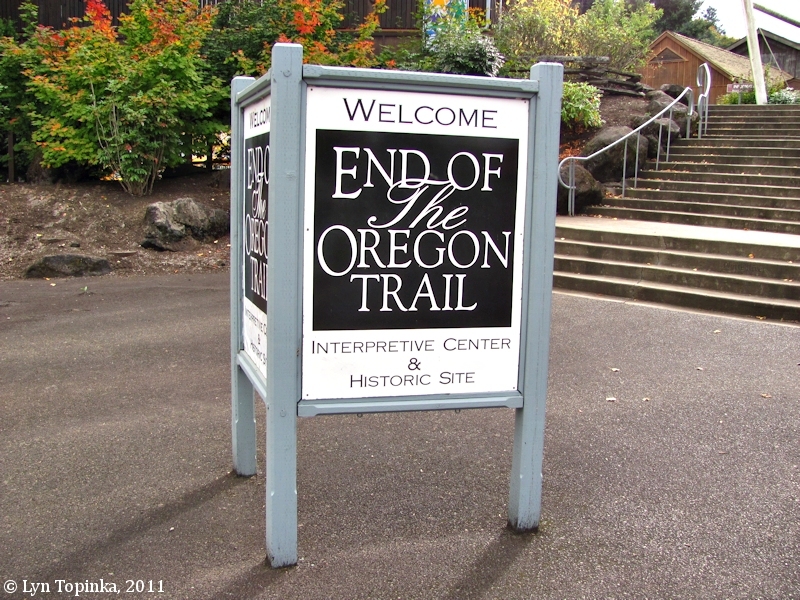 Oregon City was the end of the Barlow Road and the "Oregon Trail". 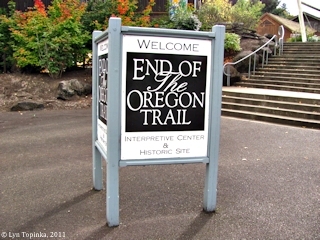 Click image to enlarge Sign, "End of the Oregon Trail", Canby, Oregon. Image taken October 22, 2011. 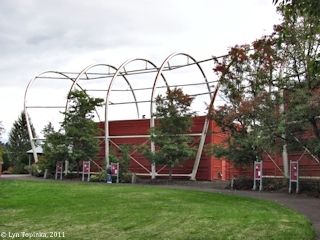 Click image to enlarge Structure, "End of the Oregon Trail", Canby, Oregon. Image taken October 22, 2011. 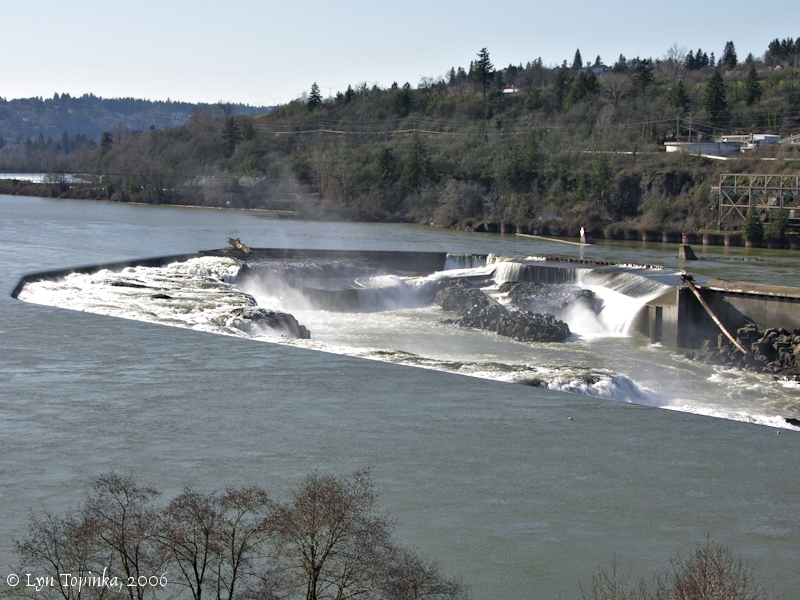 The locks at Willamette Falls were built in the early 1870s and have been in continuous use since January 1, 1873. The locks hold the distinction of being the first multi-lift navigation locks built in the United States. Total length of the locks is 3,565 feet and the usable width is 37 feet, with total lift being a little over 50 feet. The locks can handle a vessel up to 175 feet long. The lock chambers are made from locally-quarried stones ranging in size from 5 feet to 15 feet high. The lock walls have remained watertight for more than 130 years. The original lockmaster's office has been converted into a museum, and displays photographs of the historic locks. 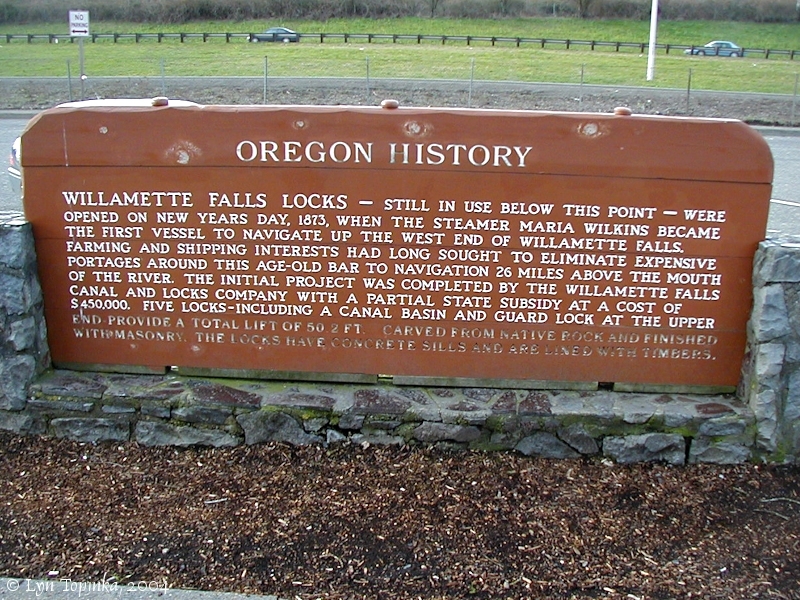 In 1974 the Willamette Falls Locks were placed on the National Register of Historic Places (Structure #74001680) for transportation. 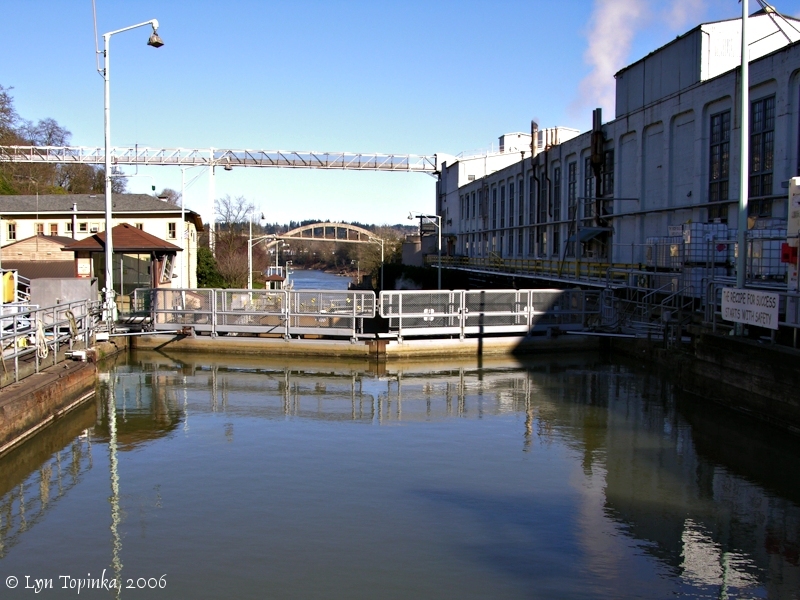 Click image to enlarge Willamette Falls Locks, West Linn, Oregon, looking downstream. Image taken February 19, 2006. 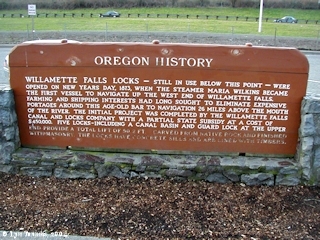 Click image to enlarge Willamette Falls Locks, "Oregon History" sign. Image taken February 15, 2004. The Willamette River Basin is approximately 180 miles long and 100 miles wide and covers 11,500 square miles (12 percent of the state of Oregon). 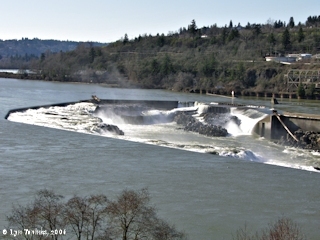 Willamette Falls enters the Willamette River at River Mile 27. Willamette River enters the Columbia River at Columbia River Mile 101. 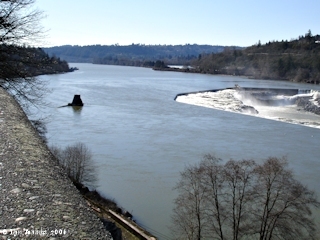 Click image to enlarge Willamette River looking upstream from Willamette Falls, Oregon. Image taken February 19, 2006. Click image to enlarge Penny Postcard: Willamette Falls, Oregon City, Oregon, ca.1910. Penny Postcard, ca.1910, "Willamette Falls, Oregon.". Published by The Portland Post Card Co., Portland, Oregon. Made in Germany. In the private collection of Lyn Topinka. Click image to enlarge Penny Postcard: Fishing, Willamette Falls, Oregon City, Oregon, ca.1910. Penny Postcard, ca.1910, "Fishing at Oregon City, Ore.". Card #7997. In the private collection of Lyn Topinka. Click image to enlarge Penny Postcard: Willamette Falls, Oregon City, Oregon, ca.1920. Penny Postcard, ca.1920, "Willamette Gorge, Oregon City, Oregon.". Published by Britton & Rey, San Francisco, California. Litho. Card #5016. In the private collection of Lyn Topinka. Click image to enlarge Penny Postcard: Willamette Falls, Oregon City, Oregon, ca.1930. Penny Postcard, ca.1930, "Willamette Falls, Oregon City, Oregon.". Published by Wesley Andrews Company, Portland, Oregon. Card #736. In the private collection of Lyn Topinka. Click image to enlarge Penny Postcard: Oregon City, Oregon, with Willamette Falls, ca.1908. Penny Postcard, Postmarked 1908, "Woolen Mill, Electric Pulp and Paper Mill, Flour Mill and Filter Plant on the Willametter River, Oregon.". Published by M. Rieder, Los Angeles, California, for Howell & Jones, Oregon City, Oregon. Made in Germany. Card #2753. Card is postmarked January 2, 1908. In the private collection of Lyn Topinka. Click image to enlarge Penny Postcard: Oregon City, Oregon, with suspension bridge, ca.1910. Penny Postcard, ca.1910, "Business Section of Oregon City, looking South, showing Suspension Bridge across the Willamette River.". Published by Portland Post Card Co. (???). Card #A1167. In the private collection of Lyn Topinka. Click image to enlarge Penny Postcard: Suspension Bridge, Oregon City, Oregon, ca.1910. Penny Postcard, ca.1910, "Suspension Bridge, Oregon City, Ore.". Huntley Bros. Co., Oregon City, Oregon. "Hand Painted". In the private collection of Lyn Topinka. Click image to enlarge Penny Postcard: Elevator, Oregon City, Oregon, ca.1930s. Penny Postcard, ca.1930s, "Oregon City Elevator.". Photo by Christian. Card #O-115. In the private collection of Lyn Topinka.